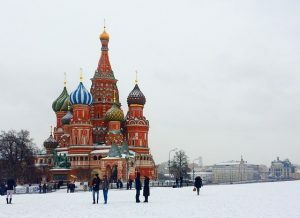 Russian ESL students face many of the same obstacles to proper English pronunciation that students from other countries do, but there are some pronunciation mistakes more particular to Russian speakers of English. Let’s talk about 3 of the most common pronunciation mistakes. Russian has variable stress patterns as does English. However, word order is fluid in Russian and fairly fixed in English. Yes, this is a big hurdle when it comes to learning English grammar, but it also poses a problem in spoken English. Russian ESL students often stress words that native English speakers do not, such as “has” and “as”. He has five daughters. —and— He is as tired as a log. They can also stress the wrong syllable of a word. Other than these hard, misplaced, stresses the tone of voice of a Russian speaker of English is often flat. This is a pronunciation mistake which occurs because there’s an uncertainty where the stresses should rise and fall because of the differences in word order between Russian and English. However, listeners rely on these vocal cues for importance of content, whether you’re asking a question, or making a statement, and even reading the speaker’s mood. A flat tone can sound hostile or impolite. Another pronunciation mistake is because, in the Russian language, the consonants “n”, “l”, “t”, and “d” are all made by touching the tongue to the back of the top teeth. In the English language, these consonant sounds are all made with the tongue in contact with the roof of the mouth just behind the front teeth. This is a small but important difference that can really help with pronunciation. Practice, practice, practice. This pronunciation tip is learned through training the mouth muscles and ear. The Russian language has 2 “o” sounds, the unstressed “o”—“ah” and the stressed “o”—“aw”. English has 3 distinct “o” sounds, the long “o”—“oh”, the short “o”—“ah”, and the reduced “o”—“uh”. Two of these are unfamiliar to Russian speakers and it can show in their pronunciation of English words containing the vowel “o”. Make a list of words with varied “o” sounds and say them out loud each day. Routine practice will make your “o” pronunciations clearer. These are not the only difficulties Russian ESL students will have when learning proper pronunciation of English. The usual suspects of “w” / “v” sounds, “r” sounds, and of course, “th” sounds can all get in line too, but the 3 that I discussed are specific pronunciation mistakes made by Russian speakers of English, and are subtle enough to get a pass in many language classes. Strive for precision and clarity in your English language studies and you’ll become more confident in expressing yourself in English. Your words will be understood the first time, every time—lightning will BE lightning!